The Kingdom of God makes all the difference in you and in your day because you are a part of it. There is no kingdom, ruler, or authority that is greater than God's Kingdom. 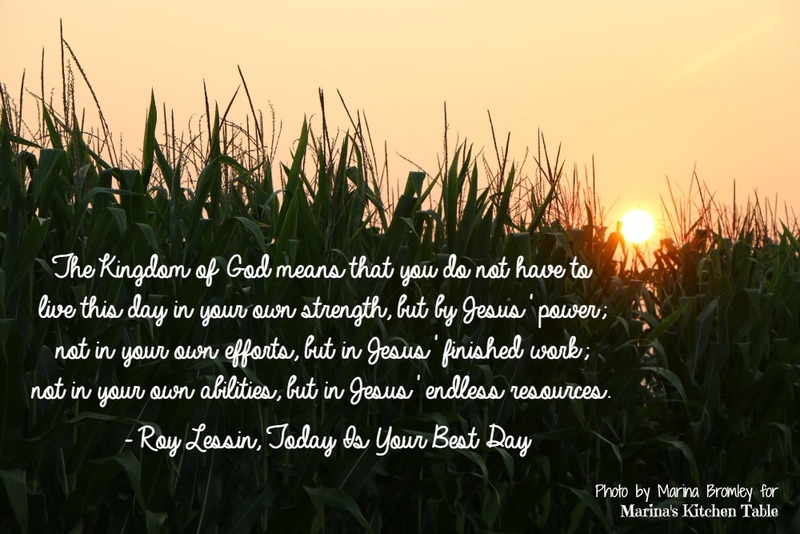 The Kingdom of God is all about the reign of Jesus Christ in your life. Jesus is the King of the Kingdom, and every benefit of the Kingdom is yours because you have the King ruling your life. Jesus reigns and rules over everything that He has destroyed, over everything He has defeated, and over everything He has conquered. Jesus is the triumphant King, the mighty Warrior, and the risen Lord. He faced the onslaughts of Satan's attacks and crushed them; He faced the temptations of sin and overcame them; He faced the grip of death and triumphed over it. Today, Jesus is your authority over the kingdom of darkness, He is your deliverer over the power of sin, and He is your victory over the fear of death. Jesus' Kingdom within you is unshakable, indestructible, and impenetrable. Nothing can come against it and prevail; nothing can challenge it and win; nothing can defy it and overcome. The Kingdom of God means that you do not have to live this day in your own strength, but by Jesus' power; not in your own efforts, but in Jesus' finished work; not in your own abilities, but in Jesus' endless resources. If you are facing temptation today, resist it and let Jesus' victory be yours. If the enemy is trying to pull you down and discourage you, let Jesus' strength lift you up and cause you to stand firm. If you are facing fear or worry, let Jesus' peace be your confidence, your hope, and your security. The Kingdom of God is a kingdom of limitless power, ceaseless joy, and unending peace. It is a kingdom of righteousness, a kingdom of love, and a kingdom of right relationships. A friend of mine was once faced with a difficult decision that involved someone else. He thought about what would be best for him, and then he thought about what would be best for the other person, finally he thought about what would be best for the Kingdom. He knew he had made the right decision when he decided to do what was best for the Kingdom. As you go through this day make every decision based upon what is best for the Kingdom, because what is best for the Kingdom is also what is best for you.